Our trip to the Ricoh Arena for the Checkatrade Trophy semi final between Coventry City and Wycombe Wanderers was mired in controversy. 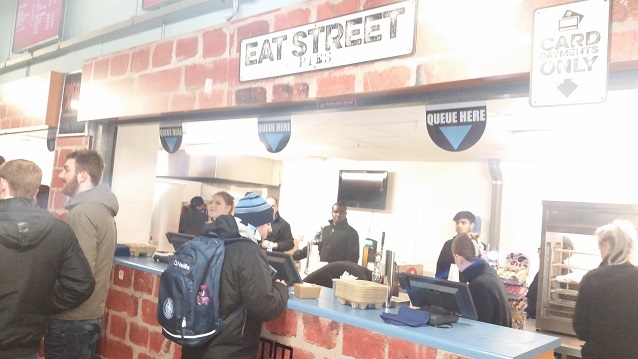 Firstly, there was a news article saying that due to the ongoing disputes between Coventry City and the owners of the Ricoh Arena, some areas of the ground were not able to sell pies! The problems Coventry were having has seen the team have to get the lawn mowers out before matches because the grass had not been cut, so I was worried that there might be catering problems.... but just in case you were worried that this might be a burger review I will cut to the chase and say that there were lots of pies available in the away end of the ground! Phew!!! Pierateer RAS ordering a pie from "Eat Street Pies"
Our thoughts next turned to finding out what kind of pies they had on offer. 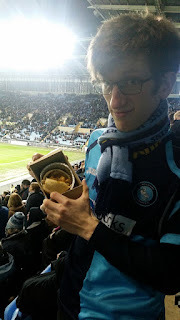 During the London 2012 Olympics Pierateer RAS reviewed a Peter’s Steak pie at the Ricoh, a common pie on offer at matches across the country. Given that it is now 2017, we thought there was a good chance the pies had changed and were eager to find out. Upon questioning, the catering staff said that the thought they made the pies on site, a claim we seriously doubted. Hardly any clubs make their own pies and we thought we would have heard about it if they did. However, the pies were nicely presented in cardboard boxes with labels denoting the flavour, it all looked quite promising. That was, until we opened the boxes. My Chicken Balti certainly looked like a bog standard mass produced pie. The ‘Peter’s’ logo being embossed into the foil gave the game away, Peter’s were still the pie of choice at the Ricoh even if the staff have no idea! The Chicken Balti did actually look fairly appealing, with a golden colour and some nice flakey pastry on top. Pierateer RAS’s Steak pie did not look so good having arrived in terrible condition. The top layer of pastry had disintegrated more than the dreams of the average Coventry City supporter, leaving a hopeless mess (reminiscent of the current state of Coventry City Football Club). Being a Pie-fessional and very committed, Pierateer RAS manned up and tucked in anyway. See our PIEremiership table for our football pie league! 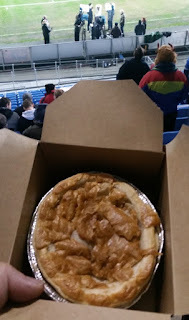 I was pleased that I was able to get a Chicken Balti pie because it was not a Peter’s flavour that I had tried before. However, as we said recently when we had Peter’s pies at Newport County, they just don’t seem to be as good as they used to be. The pastry in particular was terrible. It was so soft and soggy, my pie fell apart very badly. The very top layer of flaky pastry tasted nice but the rest was a bit like soggy bread. However, there was a silver lining in that I did really enjoy the filling. As we expect from Peter’s, the pie was quite tall which meant there was a good capacity. Sometimes this is mainly full of gravy but the Chicken Balti was well filled with meat. The flavour was good, with a bit of a spicy hit whereas the previous Peter’s curry pie I had tried, was a bit bland. Overall, the filling didn’t quite make up for how bad the pastry was but it meant a fairly respectable score. So the pies weren’t great and we were also pretty gutted that Wycombe lost 2-1 so we didn’t have another Wembley pie to look forward to. The Checkatrade Trophy becomes worthwhile once you get to the final, but only to make it to the semi-final, it felt a bit pointless. But given how bad things have been at Coventry under SISU, I felt that the Coventry fans deserved something to cheer about. Their fans really did make some noise and 11,000 was a brilliant attendance for this competition. It only goes to show what a big club Coventry once were. We are glad to review a pie for a football match at the Ricoh while we still could, due to legal battles over ownership of the ground it looks like Coventry will have to find somewhere else to play and question marks remain about whether they will continue to exist in the long term. For the fans it must be so frustrating not to have any control and for the owners not to listen to them, I really hope they can sort things out. It makes me so grateful that Wycombe came out the other side of their problems as a fan owned club! Whilst we may never make the big time we can look forward to many more seasons of pies as we follow the Chairboys around the country.